Have extra house guests for the holidays? Kids home from school? Everybody expecting a leisurely breakfast? 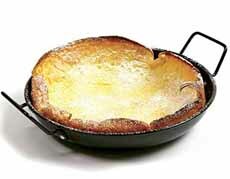 Rather than flipping pancakes, why not make a Dutch Baby, a multi-portion pancake that’s baked in the oven, no flipping required. 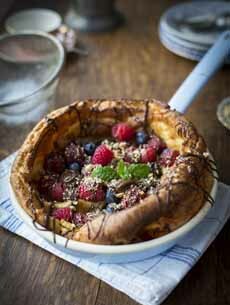 A Dutch Baby is an airy, popover-type breakfast pancake made first in a skillet, then in the oven. 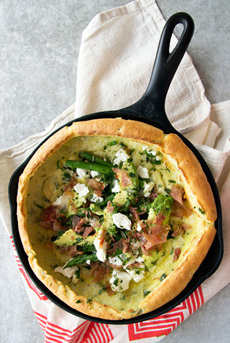 You can cook it in a cast iron skillet, or in a special pan that does duel duty for Dutch Babies and paella (plus all these uses for a paella pan). The sides puff up and are crisp like a popover the traditional accompaniment of lemon wedges which get squeezed all over the top. You can add maple or other fruit syrup, lemon wedges and/or zest, butter and a sprinkle of confectioner’s sugar—or all of them. You can pair spices with ingredients; for example, an apple Dutch Baby with apple pie seasonings. The fruit can be a topping or diced and added to the batter. They are typically sweet, but you can omit the sugar and a savory version, topped with ratatouille, leftover stew, taco fixings, etc. (see our article on savory pancakes). You can see the variety in the photos. The basic recipe includes eggs, flour, sugar and milk, usually with vanilla and cinnamon. Seasonal fruits are popular additions, as are citrus and chocolate. 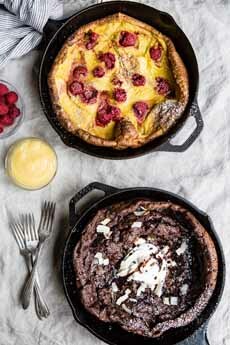 Yes, you can add chocolate sauce or other dessert sauce, fruit and whipped cream, mascarpone or crème fraîche for a dessert Dutch Baby. Frankly, we know more than a few people who’d eat this combination for breakfast (more on chocolate pancakes). The pancake is neither Dutch nor Pennsylvania Dutch, Deutsch (German), but created in Seattle at the turn of the 20th century. It has roots in small, thin crepe-like German pancakes, garnished with powdered sugar and a squeeze of lemon wedge; and the Apfelpfannkuchen, German pancakes made in a large plate size. According to Sunset magazine, Dutch Babies were introduced in the first half of the 1900s at Manca’s Cafe in Seattle, a popular spot that opened around 1902 and closed in the 1950s (here’s the history). The cafe was owned by Victor Manca, but we don’t know who provided the inspiration to adapt a German-style pancake. 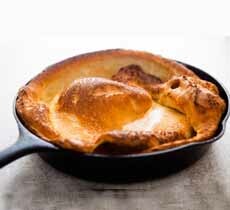 History says that the name Dutch Baby was coined by one of Victor Manca’s daughter, who may have transformed “Deutsch baby” into big Dutch Baby. The Dutch baby is a specialty of some diners and chains that specialize in breakfast dishes, such as the Oregon-founded The Original Pancake House or the New England-based chain Bickford’s, which makes both a plain Dutch baby and a similar pancake known as the Baby Apple, which contains apple slices embedded in the pancake. It is often eaten as a dessert. Thanks to Good Eggs for this recipe, which we adapted slightly and made with a variety of different toppings. A good template for the batter is 1/3 cup flour and 1/3 cup milk/otherliquid per egg. 1. PREHEAT the oven to 400°F. Combine the flour, eggs, vanilla, salt, milk and a pinch of cinnamon in a mixing bowl and whisk until the ingredients and well-incorporated (i.e. no flour lumps). 2. MELT half of the butter in a 10-inch cast iron pan over medium-low heat. When the butter is melted, add the fruit, brown sugar, and a pinch of salt. If you have a lemon or orange zest, it adds pizzazz. Use a teaspoon or whatever you feel comfortable with. 3. STIR gently to coat the pears and cook them over low heat for about 5 minutes. When the pears have softened a bit, drain the butter but keep the fruit in the pan. Then turn up the heat to high add the remaining two tablespoons of butter. Swish the butter all over the pan—sides included—so that the entire inside surface is covered. 4. SET the garnishes on the table so participants can help themselves quickly. People have been eating pancake-like foods for a very long time. According to Alan Davidson in the Oxford Companion to Food, the first mention of anything other than bread baked on a griddle is the oldest surviving cookbook, De Re Coquinaria (“On Cookery) by Apicius*. The book describes “cakes” made from a batter of eggs, milk, water and flour. They were fried and served with honey and pepper. Archaeologists have discovered grains on 30,000-year-old grinding tools, suggesting that Stone Age man might have been eating grains mixed with water and cooked on a hot rock. While the result not have looked like the modern crepe, hotcake, or flapjack, the idea was the same: a flat cake, made from batter and fried. Ancient Greeks and Romans ate pancakes topped with honey, and a Greek reference mentions toppings of cheese and sesame as well. 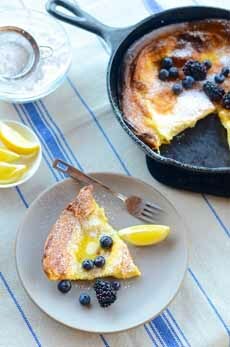 A classic Dutch Baby with lemon (photo courtesy Epicurious). 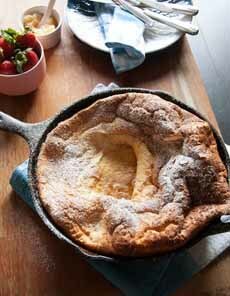 You can use your cast iron skillet to make a Dutch —10″ diameter or larger (photo courtesy Simply Recipes). A Dutch Baby/paella pan from Norpro. These foods were not called pancakes, but the first mention of “pancake” in an English dictionary dates to the 16th century: a cake made in a pan. According to the Oxford English Dictionary, “Flat as a pancake” has been a catchphrase since at least 1611. For the rest of the pancake’s journey to modern times, head to National Geographic. And remember to celebrate National Pancake Day on September 26th. We love this article from National Geographic, and recommend it as a short read on the history of pancakes. Here’s more on the history of pancakes. *“Apicius” is believed to be the pseudonym of one or several writers who authored the book. The manuscript of some 400 recipes is believed to have been compiled in the late 4th or early 5th century C.E. Why the name Apicius? It had long been associated with gourmet preferences, named after Marcus Gavius Apicius, a wealthy Roman merchant and epicure who lived in the 1st century C.E. He is said to have once sailed all the way to Libya to eat some much-praised prawns, only to return home without having found any to his satisfaction. He hosted colossal banquets, which eventually drove him to bankruptcy…and suicide.